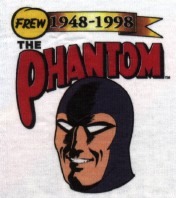 1998 was a very special year for Frew Publications, as it marked the 50th anniversary of their Phantom comic book. That's 50 consecutive years of Phantom comics! An incredible feat that is unmatched by any other publisher of Phantom comics. Jim Shepherd and his staff celebrated the special occasion with the publication of a collectors issue on 9 September, and an invitation-only dinner held at the Taronga Centre in Sydney. 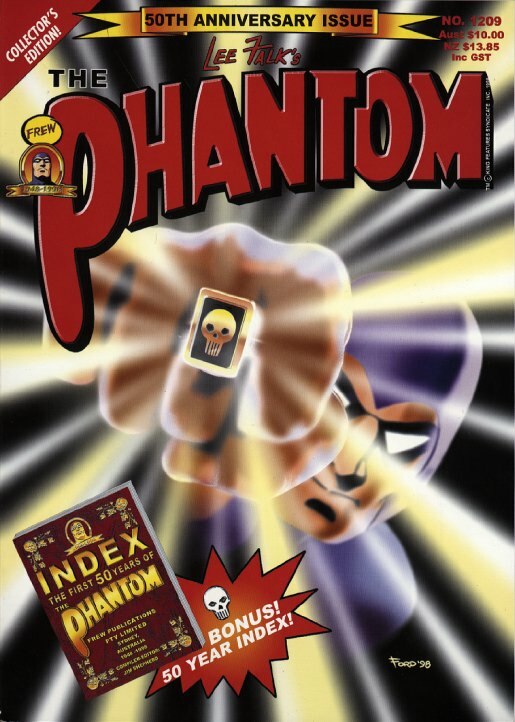 Frew published 31 editions of The Phantom in 1998, matching their regular output. These 31 issues totalled a record number of 1928 pages, at a net cover price of $79. The Annual Special in January (#1187) was the 8th of it's kind, and came with a bonus replica edition of Frew's #7 issue from 1949. A detailed breakdown of the size, price and number of issues published in 1998 is shown below, in comparison with the last three years. The cover price of a basic 36 page issue is still only $1.50 after 11 years -- incredible value! A similar trend can be seen in the average price per page. However, it is interesting to note from this graph that the total cost of a years supply of Phantom comics has maintained steady growth by the publication of increasing numbers of larger issues. A very clever policy on Jim Shepherd's behalf and one that can only please Phantom phans because we all love to read more Phantom! There were a total of 57 stories this year (including the replica edition). I'm unashamedly a phan foremost of Lee's older stories so it is always in this respect that I first review the output from Frew. Of the 57 stories, 20 were reconstructed Lee Falk classics (see table below). Plenty of Wilson McCoy and Sy Barry classics to keep even the most fastidious entertained. Still, I'm wondering when we might be treated to some Ray Moore stories again -- it's now 10 years since most were last printed, so they must be getting close to the reprint schedule. Frew also presented us with Lee's 5 latest stories: we revisited the friction between the jungle witchdoctors and modern medicine, were introduced to a new species of underwater civilization, followed the legends of Joomkar, saw The Phantom continue to introduce new legal practice in the jungle and promote the benefits of cooperation and tolerance. Combining these with the edited version of The Game of Alvar in the #7 replica edition, brings the total number of Lee Falk stories in 1998 to 26, spread out over only 7 issues. Hence Lee Falk's stories represented 46% of the total number of stories published. A little lower than last year but still a good proportion. This year there were 30 new stories originally published by Egmont (formerly Semic). There was only one multi-part story, and it came from a story written and illustrated by Kari Leppänen (co-written by Ulf Granberg), The Ring of Death (2 parts, #1211 and #1212). It seems that this is the year for artists to try their hand at writing because Hans Lindahl also wrote two stories: Return of the Zombies (#1208) and The Mastermind (#1213). All of the feature stories published by Egmont from issue Nr.19/1997 through to Nr.23/1998 were reproduced in Frew's Phantom comic. Two of these were actually reprints of older stories: Goldhand from Nr.8/1977 and Ku Klux Klan from Nr.1/1979. Claes Reimerthi was the most prolific of the Semic writers with 7 of his stories being printed. Other stories were written by Tony de Paul (5), Sverre Årnes, Scott Goodall, Lennart Moberg and Ulf Granberg (3 each), the Ikonen / Hansgård / McLaughlin team, Kari Leppänen and Hans Lindahl (2 each), and finally Janne Lundström, Norman Worker and the late Donne Avenell (1 each). My favourite story from Egmont, in terms of script-writing, was Scott Goodall's City of the Skull-Marked Men . Romano Felmang and his team of artists were the most prolific of the Egmont artists with 6 stories. Other stories were illustrated by Hans Lindahl and Carlos Cruz (5 each), Joan Boix (4), César Spadari (3), Kari Leppänen (2), and lastly Lennart Moberg / Christer Thunborg and George Bess (1). And finally ... the covers. Jim Shepherd has topped the list for creating the most Frew covers this year with a tally of 11. Other art credits for the covers were as follows: Antonio Lemos (9), Glenn Ford (6), "Tessa" (4), and one by an undisclosed person. Glenn Ford contributed a run of 5 consecutive covers starting with the 50th Anniversary Special. This cover, shown above, was yet another of his special computer-generated designs. Apparently it was completed in a rush, but it is still a very powerful cover and certainly the best of the year.